Doorway to Hell collects together the latest stories featuring Peter Capaldi's Doctor and a brand new companion, Jess, from the long-running comic strip in the official Doctor Who Magazine. 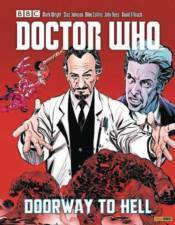 Written by Mark Wright, author of bestselling BBC Books Doctor Who titles, with art from Mike Collins, John Ross, David A. Roach, and Staz Johnson. Includes a wealth of exclusive, brand-new material revealing how the strips were created, featuring contributions and commentary from the writers and artists.